Welcome to Narrative Tango Tours! We are Elizabeth and Cyrena, co-founders of NTT. We look forward to providing you with tango services in beautiful Buenos Aires. My name is Cyrena Drusine, I am a professional tango dancer from New York City and I have been living in Buenos Aires for four years. I have performed and taught throughout the United States, Europe, South America and Asia, working with Argentines and experiencing tango first-hand in it’s original atmosphere. I have always been intrigued by tango – not only as a dance, but as an embodiment of the Argentine culture and its people. My master’s thesis on the sensual experience of tango in Buenos Aires explains how tango can be felt – not only in the milongas where the tango is danced – but also on street-corners, cafes, and in the houses of the Argentine people. Narrative Tango Tours developed out of my desire to share the sensual experience of tango in Buenos Aires with others who are similarly fascinated by tango. My insider knowledge and personal experiences with the Argentine tango enables you to grasp the importance and passion of tango in Buenos Aires. Allow Narrative Tango Tours to bring you your unforgettable experience – embody Argentine tango not just as a tourist, but as a local! My name is Elizabeth Cooke, and I am the Business Director of Narrative Tango Tours. I was born in New York City, and grew up in Portland, Oregon. I started dancing at the young age of five, and what began with a few childhood ballet classes has turned into a lifelong journey with dance and its surrounding art forms and history. My relationship with the tango began in 2007 when I came abroad to Buenos Aires for a year long study abroad program, and it is one that continues to grow every day. Fascinated by the industry surrounding the tango – including everything from record sales to the fabrication of shoes – my time abroad afforded me the opportunity to complete an independent research project on the life of tango, from it’s birth to present day, encompassing all the ups and downs of the dance, the music, and the overall culture. Much like Cyrena, I was especially enthralled by tango’s ability to transcend the mere artistic realms – tango is a way of living, not just a sultry dance or the voice of Carlos Gardel. There are hundreds of different ways for visitors of Buenos Aires to discover the tango – whatever your preferred vantage point may be, Narrative Tango Tours has a personalized option for you. Ivan began dancing Argentine folklore when he was 4 years old in Buenos Aires. In 1999, when he was 15, he entered the Ballet Folklorico Argentino of Morron, directed by Mario Bustos. He danced with them for seven years during which he performed in some of the most important theaters in Buenos Aires, such as the Teatro Broadway and the Teatro Colon. Ivan was also part of the well-known folklore company, Che Malambo and was invited as a guest artist to perform in Cosquin for one of the most important folklore festivals in South America. He also worked as a flamenco dancer in dinner-shows in Buenos Aires. Ivan has been dancing tango for the past 6 years and has performed in many famous tango shows in Buenos Aires such as Sabor a Tango and La Ventana as well as many milongas. Ivan currently performs and teaches with Cyrena in Buenos Aires. 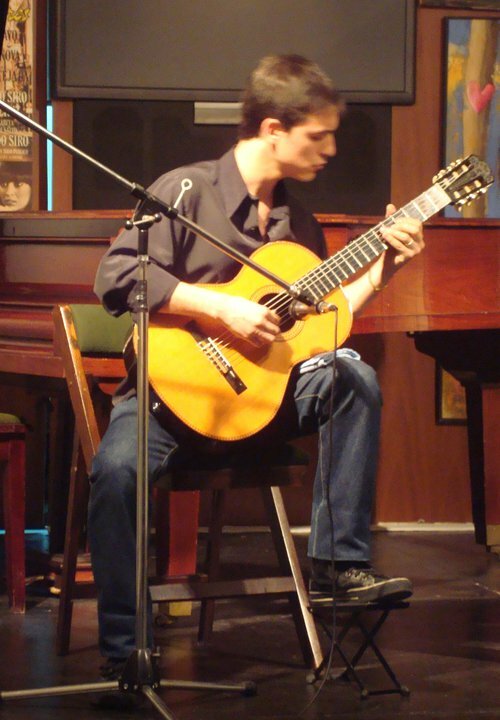 Flavio graduated from School of Music of Buenos Aires, having studied Composition and Arrangements with worldwide renowned professors like Sebastián Zambrana, Abel Patrone and Fernando “Quena” Taborda. He also participated in the Tango Orchestra in such institution. He studied in the National Tango Academy with the distinguished Maestro Anibal Arias and professors Julián Graciano, Ramón Maschio, Juan Trepiana and Fabián Bertero. After which he attended the 3rd. Contemporary Guitar Campus, which took place in the province of Córdoba, delivered by Maestros Quique Sinesi, Carlos Moscardini, Carlé Costa, Sebastián Zambrana and Daniel Corzo in joined participation. During 2009 & 2010 he did an extensive tour around New Zealand and Europe, performing in many festivals and “milongas”, giving Masterclasses for big crowds as well as private lessons, focusing mainly on Tango music. Likewise, in the last years, he has developed his career as a teacher, interpreter, composer, arranger and musician in different styles.